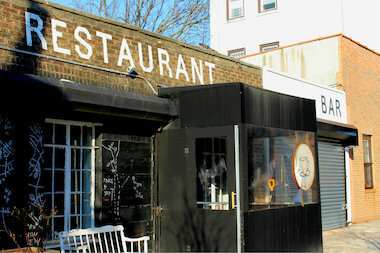 Saraghina's restaurant in Bed-Stuy will open a new bar next door to its Halsey Street location in February. BEDFORD-STUYVESANT — The owners of a popular restaurant are hoping to broaden their slice of little Italy in Bed-Stuy with the addition of a new bar. Saraghina, which opened on Halsey Street in 2009 with freshly-made pastas and wood-fire pizzas, will take over another building on the block come February, according to employees. The restaurant branched out with an artisanal bakery next door just last year. While Saraghina already boasts a bar at the restaurant, the expansion is meant to ease congestion and wait time during busy nights, said floor manager Evrotas Volman-Schwebel. The space was formerly occupied by a second-hand clothing store. Diners at the new bar will be able to pick from Italian-style tapas and restaurant snacks including mixed cheeses, cured meats and marinated anchovies and olives. The bar’s selection of cocktails will include gin and tonic with rosemary and Saraghina’s house special featuring bourbon with muddled basil. The choices will get more “intricate” with the grand opening, Volman-Schwebel said. While the space is still under construction, the new addition will have a rustic and intimate feel, with a zinc bar and bistro-style candlelit tables.